The Bees are Buzzing - Nekaro & Co. If you read yesterday's post... AND YOU SHOULD HAVE!... then you will know that we had "Quick Taco Salad" for dinner last night. I have to say just one thing about that... I had no idea that ranch dressing on a taco salad would be so darn good! Of course, like most people, I usually just give it a little dollop of salsa or taco sauce or some other taco-esqe sauce. Ranch dressing + taco salad = good stuff right 'dere. And in the spirit of trying new things, I even put tomatoes on mine. Just so's you know, I hate tomatoes, but it was like they weren't even there. It has begun. The running. The stress. The headaches. Little League baseball practices have started. My son's team practiced on Saturday and Sunday. They both have practice this afternoon at 3:30PM. Yes, that is directly after school. In fact, they don't get off the bus until 3:30PM so I had to write notes to each of their teachers to inform them that the kids would be picked up from school this afternoon. I have to write a note like that every time their mode of transport changes. Otherwise, the teacher will make them ride the bus. We had a little issue with that last year... aaaand I can't find the post to link you to it so I'll just say I had to chase down the bus to get my daughter off of it. After practice is my daughters class musical at 5:30PM. So not only will she have to change into her costume in the car, she'll be all sweaty and dirty from baseball practice. She would have played softball if I'd know that she was old enough for a girls' softball team for anyone wondering why a little girl is playing baseball. Speaking of her musical, she is playing a honeybee. I found out last week around Thursday or so that I had to make her a costume. No problem. *eye roll* I went to Hobby Lobby and retrieved a black t-shirt, yellow fabric, black pipe cleaners, and yellow pom poms. Then my mom told me that honeybee's were brown-ish. WHAT!?!?! 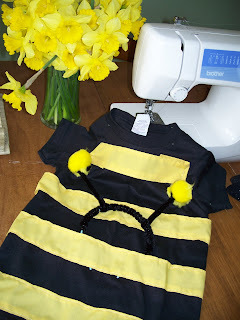 Nope, my little honeybee is going to be the same color as all the other stinkin' bees out there. And that's my final answer. They are only in the 2nd grade so they'll never know the difference.... right? ?